Coffee has long been a morning perk and an afternoon pick-me-up, but consumer preferences constantly evolve, and coffee is no exception. 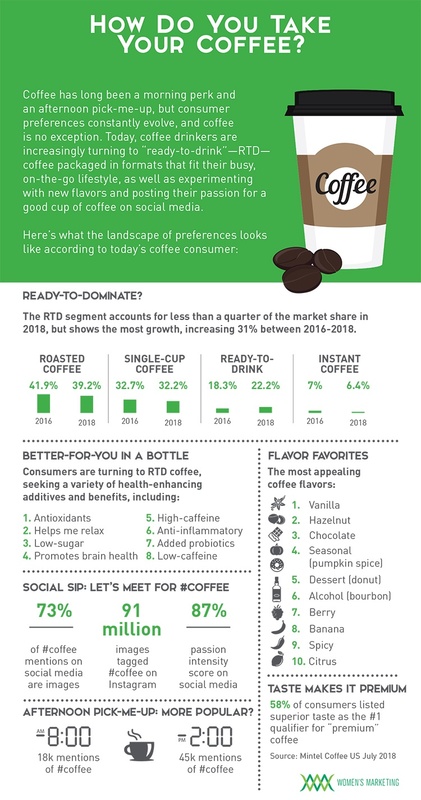 Today, coffee drinkers are increasingly turning to “ready-to-drink”—RTD—coffee packaged in formats that fit their busy, on-the-go lifestyle, as well as experimenting with new flavors and posting their passion for a good cup of coffee on social media. RTD: Ready-to-Drink or Ready to Dominate? Ready-to-Drink formats spell success for coffee brands. The RTD segment accounts for less than a quarter of the market share in 2018, but shows the most growth, increasing 31% between 2016-2018. 58% of consumers list superior taste as the #1 qualifier for "premium coffee." Women's Marketing has a deep history of delivering real-time analytics and insights on both industry trends and what consumers want from brands across a multitude of categories. Let's have coffee and discuss what we can do for your brand!